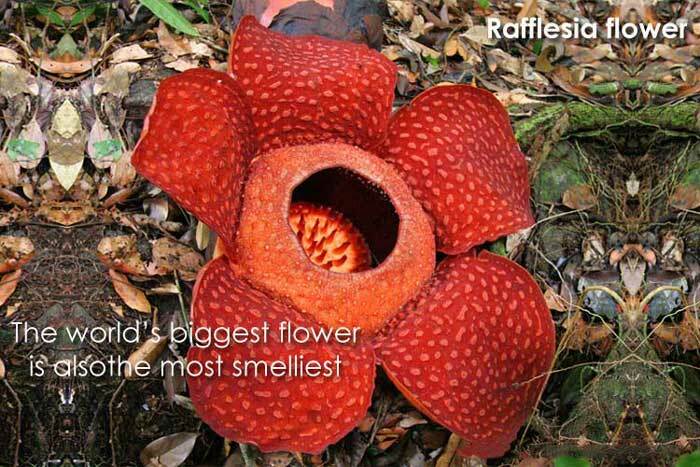 The flower with the world's largest bloom is the Rafflesia arnoldii. This rare flower is found in the rainforests of Indonesia. It can grow to be 3 feet across and weigh up to 15 pounds! It is a parasitic plant, with no visible leaves, roots, or stem. It attaches itself to a host plant to obtain water and nutrients. When in bloom, the Rafflesia emits a repulsive odor, similar to that of rotting meat. This odor attracts insects that pollinate the plant.